There are a lot of problems banning ip-adresses, hardware, credit-cards etc. In real life people often have a DHCP-ip-adress from their ISP (and therefore the ip changes once in a while), people sell hardware to others (who cannot play games then), parents buy things for their children and one stupid child could spoil the fun for others (the parent or other children), people can change creditcard etc etc. EA has many customers and even though this would only affect few people it could be enough to get them in legal trouble or give them bad publicity. You can change an IP.. a bit harder to switch a MAC address unless ur into swapping equipment. I'd be down to have both... it will make it a bit harder than just setting up a new account... which is why IMHO they will never do it. The really would like to sell cheaters more copies of this game IMHO. So it seems the REPORT feature isnt at all being monitored?? Isnt this the guy EVERYONE talks about?? What has been mentioned by others is cheaters play on an account, account gets banned, they change the name. open a new account, then rename the new account to the original name and carry on....... once banned, the name should be locked imo. Excellent idea, it's odd that EA doesn't already do this. I'd also like to see more done to positively ID buyers of the game and refuse to sell additional copies to someone who is banned. The online retail industry does a pretty good job of knowing who they're selling to, there is no reason the video game industry can't do the same. The hacks for the new ea game have built-in hardware id changing software. Its trivially easy to change an IP address. MAC addresses and hardware IDs can be spoofed. I must be in a perpetual sin-bin since every post I write gets sent to the filter. Spectated two today on different occasions. One was not hiding it all. He was following people through walls and shooting them on the other side, from pretty far away. I called him out and he left almost immediately. The other was shooting guys through smoke at a distance. He had NO way to know they were in the smoke. When he pointed at them, there was already smoke and they were REALLY far away. Another guy in the game started saying that he has reported this guy several times. This game is absolute GARBAGE. I really do hope EA goes broke, they are terrible! EDIT: Forgot to mention, when I called the second guy out his buddies started insulting me (pretty typical), breaking the EA TOS. Not only are they letting these guys cheat, breaking the TOS, but they are also letting them break it by attacking others who call them out. There has to be something legal we can do against EA for this game. EA/DICE response to all this Cheats/Hacks....."We're working on it"...This was said 10 Years ago. Found another one in spectate mode... Guy was crying saying that he's been getting blamed in 3 games now... That tells a lot. I mean, three BF games now... The guy hides his stats, disabling 3rd party stat tracking. He was following people through walls, confirmed in the mini-map. AND, of course he attacked and insulted me for calling him out. 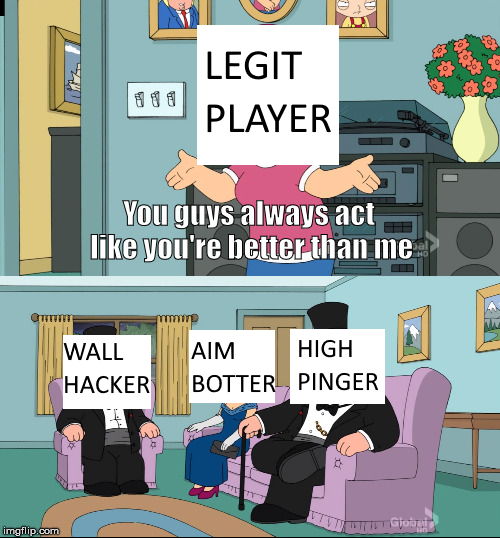 EDIT: I've been called cheater before and never felt the need to attack anyone... I would say, the guilty would feel the need to attack. I plan to get together a MASSIVE video and use it to crush the reputation of this game. The only sound in the video will be me narrating, just in-case EA decides to try and pull copyright on me, like they have in the past. This saturdaynight was another rough on Conquest, it seemed they were all out in force. Hope they'll gonna move on from BFV to Apex/Anthem soon, so I'm not bothered with them. Dice goes ''See Nothing Hear Nothing Say Nothing''. Just before 5mins, support hipfiring headshots across map in Hamada with mg42, and sniper doing suddenly 180c turn and instant headshotting from PRONE position with Lee Enfield while going to knife him in 2mt distance. Plus, dunno if anyone is aware about Grenade aimbot. Check TaisonTV yt vid ''BATTLEFIELD V CAZANDO CHETOS EL ULTIMO DE 2018 - MAS EN 2019'' and go to 15:25. It's hilarious and sad at the same time to watch Grenade flying>change direction in air>following target and goes boom. Oh right.. that's what I was saying in my post.. didn't read yours yet. So ya.. the Apex cheat has a HWID spoofer.. meaning that you can rage cheat, get banned, get another HWID, rage cheat, get another HWID. It's free to play so 500 origin accounts later, little Billy is one shotting everything every match. With any luck, having the game destroyed by an impossible to prevent cheat might cause some people to reconsider what it is they're doing. I witnessed cheating tody so I joined another server as a spectator. Watched another player blatantly cheating. They knew where players were and were just getting instant headshots. That was when using mg's. Then they switched to sniper and again knew where players were and snapped onto the targets (like the console auto aim with a controller). Instant headshots etc. Seen a few cheats since launch but 2 out of 2 servers today had cheaters in them. As suggested there seems to be a plague of them at the moment. Can I get an "Amen"!?! You won't get an amen, Especially since you violated the rules and circumvented the profanity filter. You can have something else though.